Bill Frank attended San Diego Junior College, then returned home to play at the University of Colorado before joining the Canadian Football League with the BC Lions in 1962. Bill Frank played for three teams during his tenure in the CFL. For three seasons, Frank was as a member of the Lions, he would gain a reputation as a rough and tough offensive and defensive tackle. In 1965, after a brief stint in the National Football League, he joined the Toronto Argonauts, where he remained for four seasons. 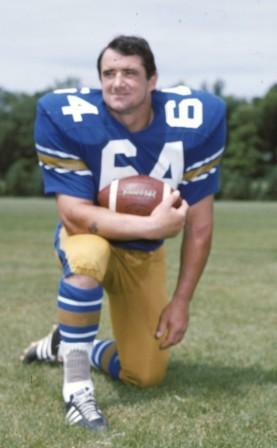 Frank returned to the West Division in 1969 as a member of the Winnipeg Blue Bombers, where he remained until his retirement in 1977. Some highlights of his career include being named CFL All-Star seven times, Eastern All-Star three times and Western All-Star four times. He also won many other awards and honours recognizing his significant contributions to Canadian football during his 15-year career. Bill Frank was inducted into the Winnipeg Football Club Hall of Fame in 1990.